Baby’s first whale sighting doesn’t happen on this trip, but it’s a good day out of the house. TILLAMOOK, Ore. — One of the fun parts in having children is discovering the ways they reflect you, not just in eye color or the shape of their nose, but in the ways they interact with the world. My daughter, Lucy, is a tiny ball of lunatic energy. At just a few months, she was rolling around our living room. At 5 months, she’s crawling all over the house, seeking out brave new corners of our dwelling like a miniature Starship Enterprise. This has been amusing for my wife, Robyn, who during the past five years has endured my very similar tendency to explore every river, canyon, trail and mountain in Oregon with a caffeinated impatience that hasn’t allowed much time for sitting still. This is all a very long way of explaining why we — and probably Lucy — have never had much interest in whale watching on the Oregon Coast. It would be grand to spot nature’s gigantic creature swimming past, no doubt, but the practice of driving to overlooks and staring at the ocean has always seemed a little slow, even boring. 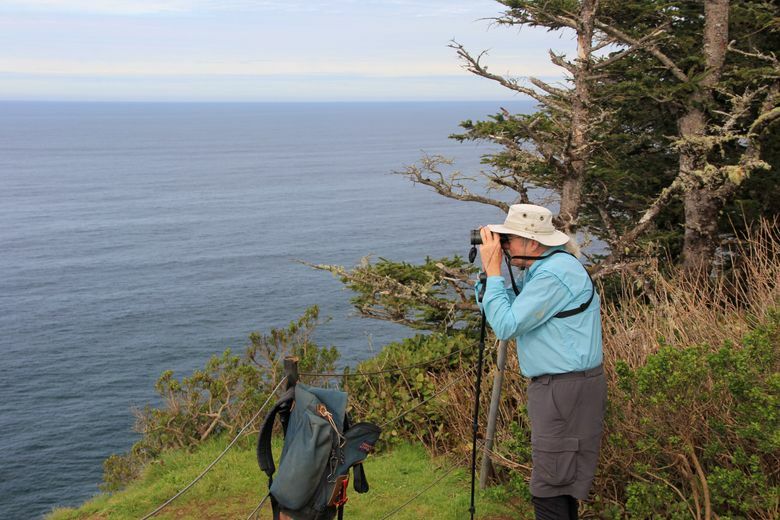 That’s why we were excited to spend time at the coast near Tillamook combining whale watching with hiking at Cape Lookout, home to one of the best trails and viewpoints on the Oregon Coast. It was a chance to add movement to an activity primarily about observation. The hike is 4.8 miles round-trip and mostly flat, though the trail is muddy and rocky in places and best described as moderate in difficulty. Boots are a better choice than tennis shoes. The upside is that the massive headland takes you two miles into the ocean, providing views closer to where the migrating gray whales can be spotted as they make their way north to feeding grounds off Alaska. March and April is when gray whales typically migrate northward from birthing grounds in Mexico to summer feeding grounds off Alaska. During a Whale Watch Week last spring, 104 whales were spotted from Cape Lookout, the third-highest total on the coast. Upon arrival, we packed Lucy into a front-carrier called a Tula — it’s a bit like carrying your baby in a kangaroo pouch — and prepared to head out. We hiked the first half-mile with Ranger Korbe, who told us about the cape’s geology, history and ecology, and offered tips for whale watching. Cape Lookout was formed from the Columbia River Basalt flows that erupted from fissures in Eastern Oregon 15 million to 17 million years ago. The massive lava flood traveled 400 miles from the vents and fanned out on the north coast, creating the islands and headlands along the ocean that include Cape Lookout. On the cape, the forest is dense with large Sitka spruce and hemlock, which surprised me considering the high winds that slam the cape during storms. Just down the trail, we reached an opening in the forest and stopped at our first potential whale-watching spot. Conditions were perfect, with a calm ocean and views that extended almost 30 miles south. “First we have people scan the full horizon and look for a spout,” Korbe said. “Gray whales can spout 10 to 15 feet in the air and it’s the telltale sign. No spouts were seen, so we continued on. The trail wove between deep forest and views high above the ocean, as blooming white trilliums added color to the canvas. The final half-mile was spectacular, as the trail follows the cape’s edge. Lucy made “ohhh” noises as the ocean breeze swept across her cheeks. We reached the cape’s end and the main lookout in about 90 minutes of hiking and found a view beyond our expectations. To the south, Haystack Rock, Cascade Head and even Cape Foulweather near Newport were visible. In the west, the vast expanse of ocean rolled 35 to 40 miles to the horizon. We took Lucy out of her Tula with the hope of her spotting her first whale. No such luck. Jim Border, a whale-watch volunteer, helped us scan the ocean. He told tantalizing stories of whales breaching just below the cape, putting on a show for everyone in attendance. Still, we saw no spouts. “People will be out here for hours looking for whales, and sure enough, as soon as they leave, we’ll see a spout,” Border said with a chuckle. Eventually we put Lucy down on a blanket. She busied herself crawling around the cape, exploring the vegetation and even made friends with a chipmunk. Robyn and I alternated between watching our daughter and the ocean. After a little more than an hour, my trademark genetics started to kick in. Lucy started getting designs on crawling near the cliff’s edge and my legs got twitchy. And so we turned around and headed home without seeing a whale, but we still had fun hiking and learning about the whales that are out there, somewhere.